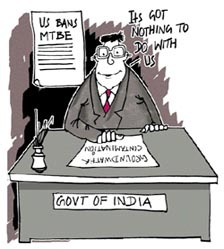 while Methyl Tertiary Butyl Ether ( mtbe) - a harmful blending stock used as a mix with unleaded petrol to increase oxygen content in petrol for cleaner burning - has been dumped in the us where it has caused serious problems of groundwater contamination, the Union ministry of environment and forests ( mef ) is callously promoting its use in India. The mef claims that a move to make the use of mtbe mandatory in India to reduce carbon monoxide emissions is under consideration. While trying to deal with one problem, the government seems to be creating a new one. At a press conference, held in Delhi on August 9, 2000, Anil Agarwal, director of the Delhi-based Centre for Science and Environment ( cse ), suggested that ethanol be used as an oxygenate instead of mtbe and demanded that the mef set up a committee to formulate a policy on the best oxygenate to be used as soon as possible. MTBE: a disaster in the US California has already banned the use of MTBE from 2002 onwards and a similar decision has been taken by the US government - discussions on the issue are already on in the Senate. The chairperson of the Senate environment and public works committee, Bob Smith, is reported to have said: "MTBE has done more damage to our drinking water than we really would care to know. This is a serious environmental problem that must be addressed." A review of a number of studies in the US shows that MTBE is not even very effective in reducing carbon monoxide and ozone levels. Actually the reductions that have been seen in the US after the addition of MTBE can be attributed to many other developments that have taken place in automobile technology. It is an extremely serious groundwater contaminant. MTBE seeps into groundwater very quickly, primarily due to leaking underground fuel storage tanks and also at spills from the fuel distribution facilities. It is also suspected to be a carcinogen for human beings. Experiments on animals have proved that it is highly carcinogenic. The MTBE problem is evidence of the Union government's completely fractured approach to fuel quality regulations. While phasing out harmful lead from petrol in 1998, the government ignored the potential problem of benzene emissions and had failed to regulate benzene and aromatic content in petrol. Therefore, to deal with knocking problems in vehicles, the refineries started providing unleaded petrol with high quantities of benzene and other aromatics, which are known carcinogens. Pushed by the court, and in the wake of growing problems from benzene emissions, the government has agreed to supply unleaded petrol with 1 per cent benzene content by October 1, 2000. But this will only be in the National Capital Territory. Therefore, the issue of adding oxygenates has come up to deal with the knocking problem and to ensure good combustion and, therefore, lower emissions. Since groundwater is the main source of drinking water not only for millions of people living in rural India, but for people in urban areas too, the contamination of groundwater by a substance that is possibly a carcinogen poses very serious problems. In a letter to the MEF, Agarwal wrote: "If you don't stop MTBE, you will be allowing the biggest possible murder of our people on a largescale because groundwater is the main source of drinking water in India and is becoming an important source even in towns. And most of it is imbibed without any treatment." Alcohol, from molasses and other agro wastes including ethanol, has immense potential to be used as oxygenates as well as automotive fuel. But their potential as a clean fuel has been ignored in India. While the country has vast potential for ethanol supply, given the size of its sugar industry and agricultural waste, very little effort has been made to exploit it as a clean fuel option to control air pollution. Only recently, the ministry of petroleum and natural gas has taken note of it and set up a study group. According to experts, India is second only to Brazil in the world in the production of molasses and ethanol. With 465 sugar factories and 280 distilleries, there is surplus ethanol available in many states such as Maharashtra, Uttar Pradesh and Tamil Nadu. Since the demand for alcohol with a 5 per cent blend in gasoline fuel is around 300 million litres per year, while the annual production of alcohol is already 6 billion litres, there cannot be a shortage in supply. Even the alcohol industry is confident about its availability if a 5 per cent blend with gasoline is implemented. The All India Distillers Association (AIDA) estimates that the utilisation of Indian distilleries is as low as 45 per cent. But even with such a low utilisation, India can sustain a 5 per cent blend in gasoline, they claim. Moreover, all the ethanol in India is produced from molasses, unlike Brazil where ethanol is produced from sugarcane directly. Therefore, some experts feel that India could immediately start using a 5 per cent ethanol blend with gasoline. However, oil companies and alcohol manufacturers have failed to reach a common ground. Both the price of alcohol and the infrastructure requirements for its supply and dispensation remain a contentious issue and could continue to plague its move towards implementation. The ex-distillery price has been quoted at Rs 18.58 per litre by AIDA, which the oil companies say is too high. Besides, the oil companies are also unwilling to make the necessary investments for storage and transportation. Apparently, Maruti Udyog Ltd has informed Winrock International - a New Delhi-based non-governmental organisation that runs a programme on ethanol - that Indian cars are designed to accept a blend of 5 per cent ethanol by weight. Any amount in excess can have adverse effects on the engine components. In other countries, engines are designed to accept a blend of up to 10 per cent.